Much of the population change for the state has occurred due to migration into the state; per estimates by the Carolina Population Center, nearly half, or 43 percent, of the Old North State's population were born out of state. 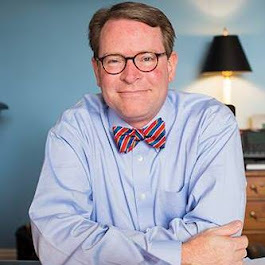 This dynamic is also being played out in the state's registered voter pool. Based on data from March 3, 2018 from the NC State Board of Elections and Ethics Enforcement, of the nearly 6.9 million registered active and inactive voters in the state, 85 percent of voters indicated a "birth state." 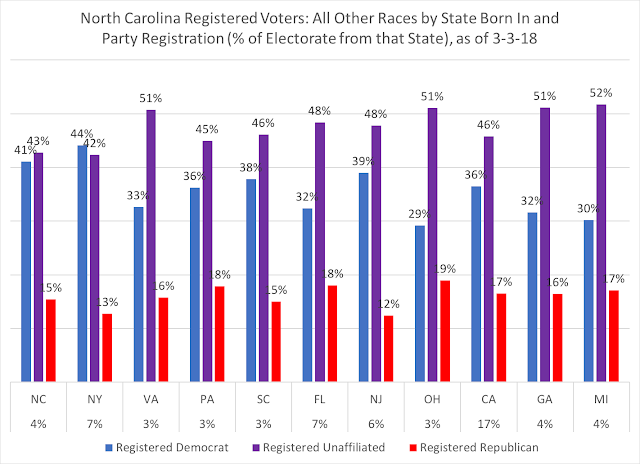 Of those 5.8 million voters who indicated a birth state, 50 percent were born in North Carolina. 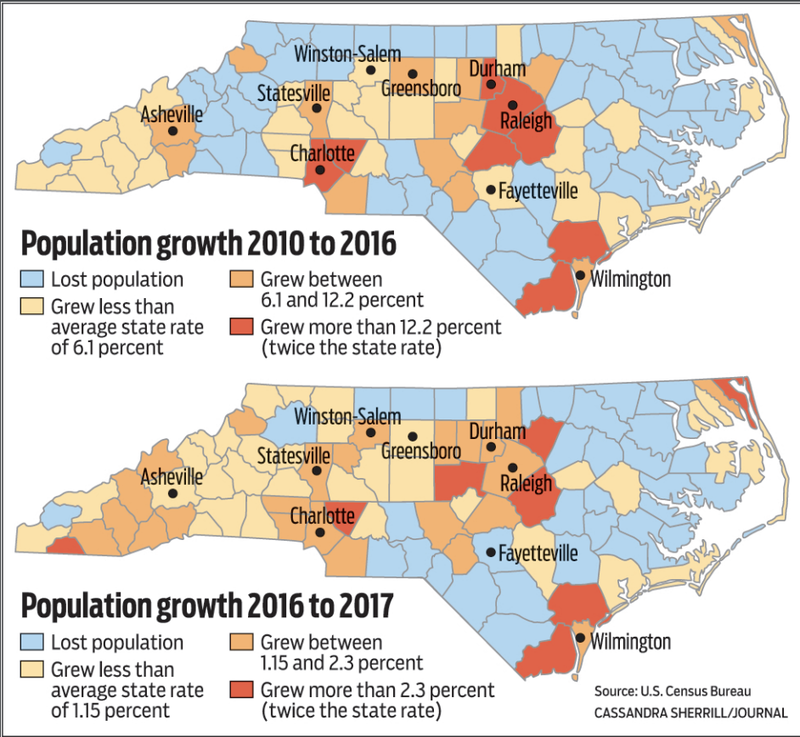 The top five birth states--New York, Virginia, Pennsylvania, South Carolina, and Florida--account for 20 percent of the state's registered voters who identified a birth state. 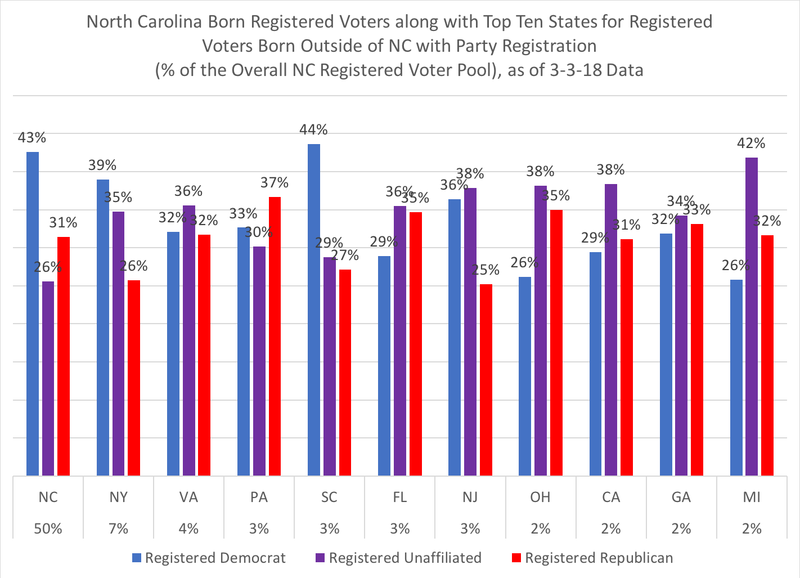 As indicated by the party registrations from each of the states, there is no real pattern or sense of party affiliation coming out of the non-NC states, though some states present an interesting picture of their party registrations. For example, as some would think would be the case, a plurality of New Yorkers (39 percent) registered as Democrats, with barely a quarter (26 percent) registering as Republican. However, a plurality of Pennsylvanians (37 percent) registered as GOP with a third as Democrats. 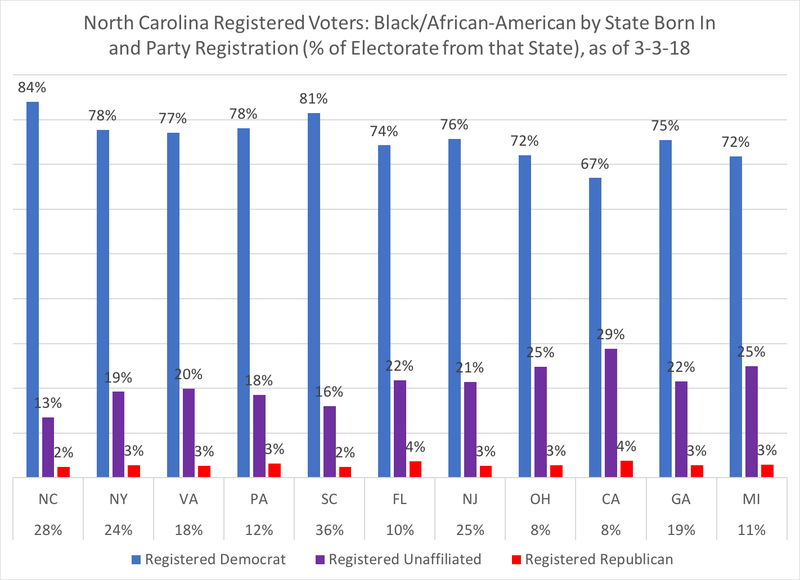 South Carolina's 44 percent registering as Democrat is due to the high percentage of black/African-Americans from that state. New Jersey and Ohio both saw 38 percent of their registrants go unaffiliated, but mirror images when it comes to partisan registration. The majority of registered Democrats are native North Carolinians, while a significant majority (almost 60 percent) of registered unaffiliated voters are born outside of the state, with registered Republicans split almost evenly between native and non-native born registered voters. 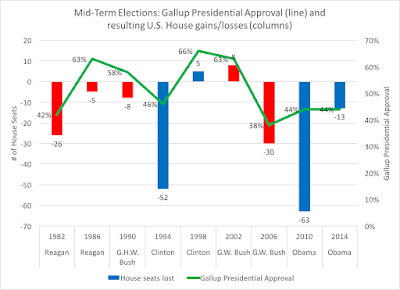 The likely explanation for the nearly 60 percent of registered unaffiliated voters as non-native is the fact that upon moving into a state, a non-native may not necessarily know the party dynamics of the local area, or the state, and simply decide to register unaffiliated, thus keeping their options open for deciding which political party to cast their ballot in for primary elections. 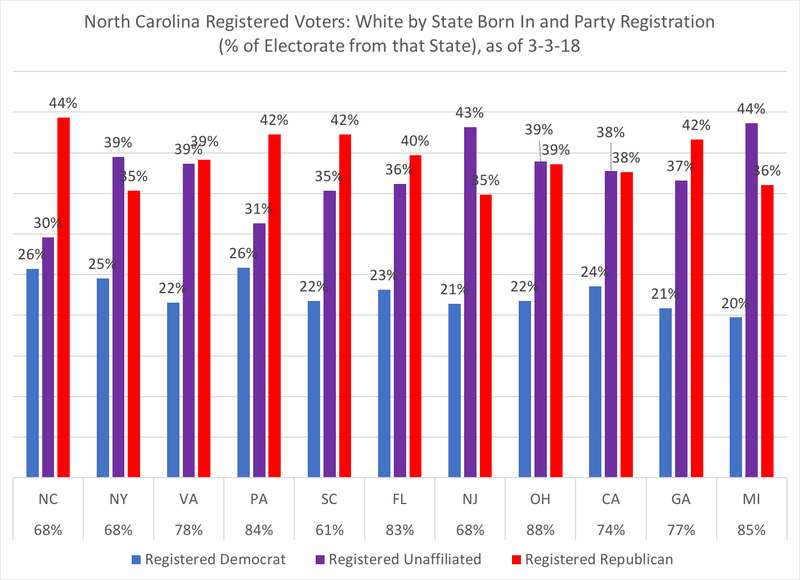 White voters from Southern states, such as Virginia, South Carolina, Florida, and Georgia, tended to register Republican, a trend that is typical among most Southern whites. Interestingly, of the northern states, such as New York, Pennsylvania, New Jersey, and Michigan, unaffiliated registration tends to predominate, with the exception of the Keystone State and a plurality of Republican registration. The traditional allegiance to the Democratic Party in registration is most pronounced in native black voters, but non-native born black voters registered at a higher percentage (17 percent) as unaffiliated versus native born black voters. 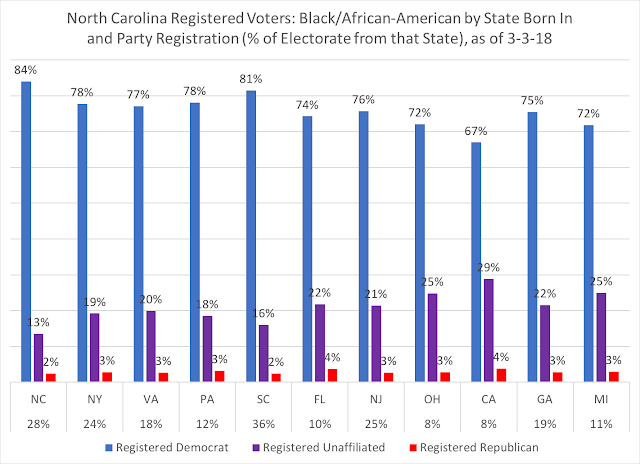 As noted above, the likely attribute to neighboring South Carolina's overall Democratic registration plurality is due to over a third of SC-born voters are black/African-American. 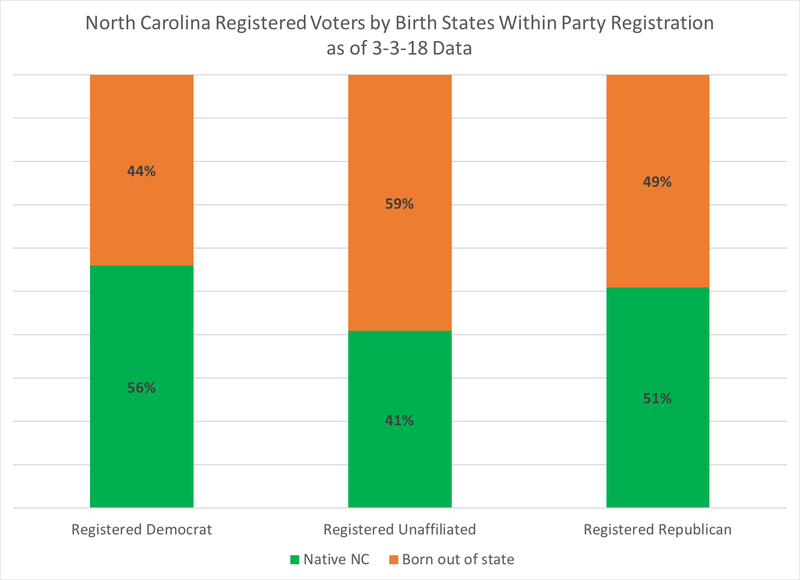 The striking pattern is the pattern of Republican registration being under 20 percent for both native and the top ten non-native states, with near majorities (and in four states, majorities) of voters registering unaffiliated. Younger generational cohorts, the Millennials and Generation Z, are substantial pluralities of current registered voters and come from California (a combined 44 percent of their voters are under the age of 37) and Florida (43 percent are Millennials and Gen Z). 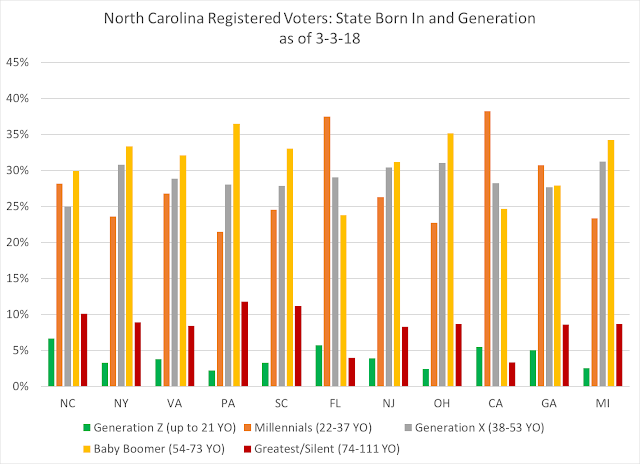 North Carolina native voters were fourth among this list of combined Millennial and Gen Z cohort voters. 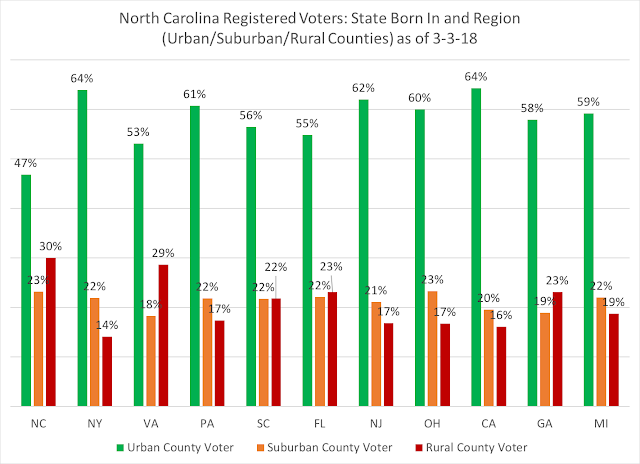 Finally, I was curious about the patterns of where these registered voters resided: in urban, suburban, or rural counties. 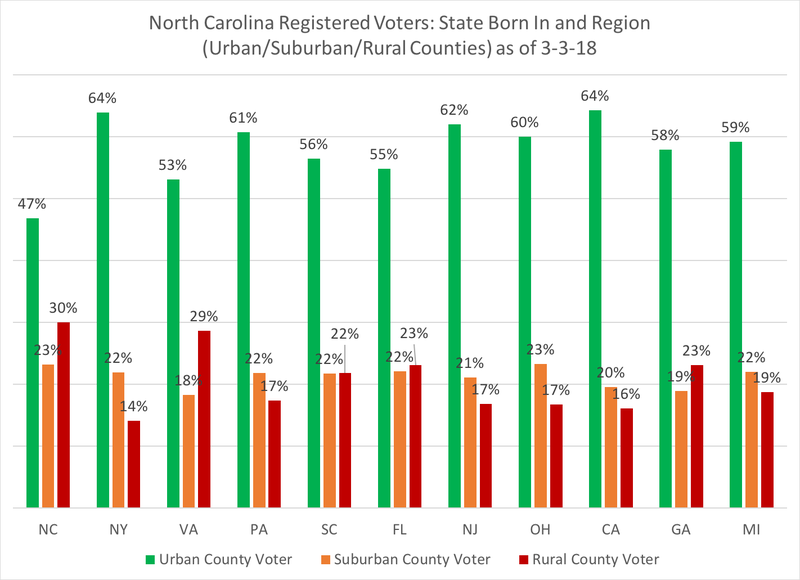 For a baseline, 54 percent of all registered voters reside in urban counties, while 22 percent are in suburban counties and 24 percent are in rural counties. Native registered voters tended to be much more rural and less urban, while most all of the top ten non-native states tended to be above the state average of urban county voters. Virginia, like its neighbor to the south, had a higher percentage of rural residing voters, but the remainder of states show the predominance of non-native voters living in urban counties. With the registered voter pool estimated to be half native, half non-native in the Old North State, the continued attraction of North Carolina as a state to live in will have continued impacts on its political dynamics, along with other aspects of the Old North State.